ok so before I update on the wedding we went to this weekend, I thought I'd give an update on an old post. 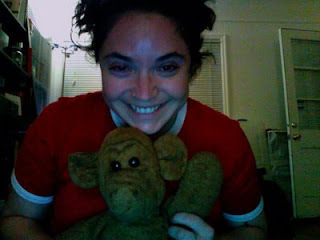 For those of you who think I forgot about my monkey, you're WRONG! Da5id found him last week at a Goodwill out in Beaverton (suburbia)! I was soooo happy! He was not allowed to go camping because I was scared that that would be pushing my luck. So! My boy loves me. He put out a missing monkey report at the Goodwill WAY out in Hillsboro and then followed through on it. I'd also like to thank Liz (aka KAL) for reminding me about the prayer to St. Anthony. It worked! Mitch is back at home and I couldn't be happier! So glad you got your Monkey back. And way out on the West side no less. I was concerned after reading about your misplacement last evening. That's one of the oddest things I've read. How the hell did your monkey get to Beaverton? I know if he was hitchhiking, I wouldn't pick him up. You never know what a monkey will do... they're nuts. And they fling poo. Gross. YAY! St. Anthony works hard for the monkey...so hard for Mitch, honey! @Coidric: I accidentally donated it to the Goodwill (the cheeky monkey was in the Goodwill bag!) that is a distribution center. The boyo went to it and had to put a missing monkey report which they sent out to all the Goodwill stores. They then hold any monkey fitting that description, and it seems that the Beaverton store got it. Mitch does not fling poo! He's quite the domesticated monkey... although I wouldn't put it past him to have hitched a ride.